Once upon a time, there was an Irish barmaid named Christina Hendricks. She encountered a lusty vampire by the name of Angelus, who offered her immortality in exchange for a kiss (and some grapes). One kiss (and some grapes), for immortality? A fair trade, she thought! Only when she heard Angelus speak further did she realize her terrible mistake. Would he terrorize her with that atrocious accent for all eternity? No, no, she would not stand for it! She disappeared, boarding a ship for the colonies, desperate to leave Ireland, for, sadly, Angelus had ruined the Irish accent for her entirely. 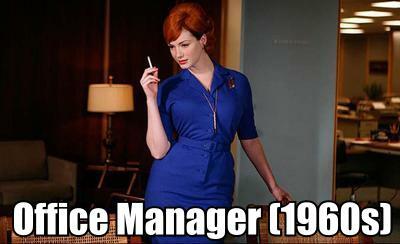 Time passed, and she resurfaced in the 1960s as an office manager named Joan Holloway. She had much experience dealing with the advances of men from her time as a barmaid, but nothing had prepared her for the level of sexist douchebaggery—a phrase she privately coined herself, although it would not come into vogue for several decades—at Sterling Cooper. Men leered at her and treated her with disrespect, simply because she was a woman! Yes, the accents were fine, and there was no trace of Angelus—although that new upstart account executive reminded her of him for some reason—but it did not seem like she had made much progress in two centuries. Men were men, it seemed, wherever and whenever she was. Time passed. She became Nicolette, Olivia, Blanche. She always endured. Then, the Earth got used up, and she turned to a life of crime, taking the name of Saffron. Or Yolanda. Or Bridget. Or...whatever. At this point she was simply fed up with everyone and just started shooting people. This is a good post and you should feel good about it. Why. Why is this the most amazing thing ever. That is so awesome. 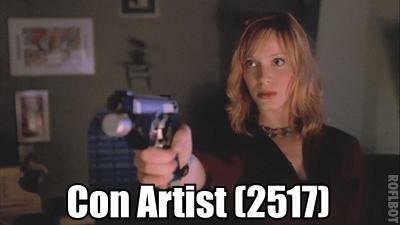 I never realized that was her on Angel and I thought I knew all the obscure Jossverse casting trivia. I thought more people knew about it! I feel like I've known forever, so I always assumed it was one of those things everyone knew, like Joss's various hat tricks. It has been proclaimed and therefore shall be known as the truth! Hee, dude, so awesome. She coined douchebaggery!! She ought to be given an award, lol. I love you and I don't even swing that way. Have my biologically impossible babies. This is ridiculously awesome and I had no idea that she was the one in the Angel flashback either! HEEEE! I love your headcanon, sir.